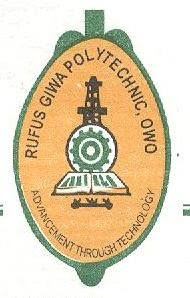 Rufus Giwa Polytechnic, Owo, RUGIPO Academic Calendar for first the semester and second semester of the 2018/2019 academic session has been approved by the academic board and published online. The Rufus Giwa Polytechnic Academic calendar shows a break down of its academic activities for the 2018/2019 academic session. 5. 8th March, 2019 Lectures Start for Returning Students. 5. 27th September, 2019 End of the 2018/2019 Academic Session.